" The Horse is always right ! " Traditional thoughts and methods lead to mediocre results, no matter whether we are a beginner or a horse handler or an elite equestrian. For example, being in a hurry to confront and catch the horse, or in a hurry to load it, creates the fear of being “after“ your horse, which will instil resistance. Keeping a clear mind with a lot of patience and caring about the animal, with time to wait if needed, is of greatest necessity to accomplish your training with a then willing equine partner. This is far away from being traditional....It is much more traditional to “show him who the boss is!“ The change to a more ‘natural‘ ( natural for the horse not for us) approach is never going to work for those who are set in their ways and have a closed mind.“Nevzorov Haute Ecole” is for the positive, progressive, open- minded person who is willing to try a non-traditional way, and who has the fortitude to stick to it when the going gets tough. No matter which type or level of involvement - beginner or elite, English or Western, handler or rider. “Nevzorov Haute Ecole“ is for those people who want to achieve the maximum with their horses without the question of dominance! Because there is no dominance in the doing of “Nevzorov Haute Ecole“, there is only partnership ! Subtlety is a more effective tool than force. That’s why it is a good idea to choose non –violence to become stronger! For a lot of people, however, it is a hard tool to use, if you believe, as most people do, that you are superior to the horse. But are we really superior to someone that is for at least 10 times stronger, bigger, faster and sometimes even smarter than we are?? Think about it! But how can we achieve all this in a kind way? Love, patience, discipline and respect are the main keys! Donald U. Newe establishes such a relationship with horses that they will do amazing things for him. Being difficult only minutes before, they will allow him to move them in strange ways, move strange, noisy objects over, under and around them, and even ride them without a bridle or a saddle. Donald believes that everything he knows and has learned can be taught and learned by others. „It is not a gift or some kind of magic, but a synergy of the heart and the head,“ Donald says. „Anyone loving horses and showing the willingness to learn non-traditional approaches can do what I do.“ Donald cannot remember a time in his life when he did not have this ability to establish an uncommon relationship with animals. But much of what he brings to his students has been learned. He has studied and still does : the different behaviours of the horse, the work of some of the most accomplished horseman such as: T.& B. Dorrance and Ray Hunt, Nuno Oliveira, Michel Henriquet etc. and the old master’s books. 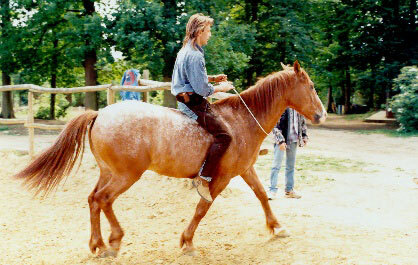 But most of all he uses what he has learned directly from the horse. When making initial contact with a horse, Donald puts the highest weight on an unforgettable first impression. The first impression is, just like with humans, extremely important with horses. With kind but firm movements he starts to explore the horse with his hands. In fact, he tries to be as nice and kind as possible. Through touching Donald communicates trust and love and every moment is spent reinforcing these feelings between him and the horse. Soon the horse is starting to display affection for the human. By this way, Donald transforms the horse`s distrust into trust. Without the traditional way of using force or other common strong-arm tactics. He develops a base of trust, respect and discipline in the horse, upon which all further development will be built. Soon the horse is giving exactly what is wanted, and is doing so out of a willingness to please, happily and eagerly. But security/safety is the second keystone in Donald`s work, the development of a „safe“ relationship. After all, remember quality No. 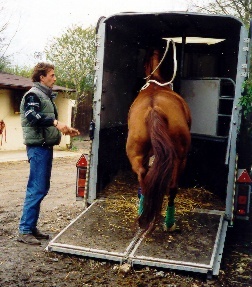 1 (see page: “Behaviour”): The horse is programmed for flight before fight. It is one of its basic instincts, and so this behaviour is disruptive or even dangerous when expressed during work with the horse on the ground or while riding. Especially with horses considered gentle the danger is higher than with the “naughty “ ones. With a gentle horse the human pays less attention and is more careless! But when a horse is properly trained and the handler/rider has got enough knowledge to reinforce that training in the long-term, the possibility of dangerous behaviour is negligible. Then, a sudden surprise to the horse or to the handler/rider might still cause a reaction in the horse, but it will moderate very quickly, which puts the handler’s/ rider‘s control only momentarily in question and usually passes without injury of any kind. Because properly trained, a horse and its handler/rider share a level of understanding and trust, which carries them through surprise situations and otherwise dangerous confrontations. If the level of trust and understanding is properly developed, the horse can tolerate nearly everything and additionally, the horse will do almost anything before it would endanger the rider. After all, „Nevzorov Haute Ecole“ is not a kind of method or system that brings only sometimes amazing results. It`s much more a philosophy, a way of being that has these amazing results. The same kind of philosophy that has made it possible for some American Indian nations to become the best horsemen of the world within only two generations like, for example, the Sioux or the Comanche, “the Lords of the Plains“. by the North American Indians. One day he found out that some Indians were hunting buffalos by riding their horses nearly naked without a saddle and reins or a bridle. At that time Donald was beginning to ask himself questions like, for example, ‚How can they do something like that ?‘.Hunting the biggest mammal in North America (over 1.000 kilos of weight) in high speed with nothing else but a high spirited horse, no saddle no bridle ....! How were they able to control the horse in a situation like this ? 1. You need a saddle for your comfort and balance. 2. You kick the horse in the ribs to go. 3. If you want to turn or stop you pull the reins. And 4. Show the horse who is the boss! Today, after spending his lifetime learning from and about horses Donald knows how they could do it. And it is this kind of knowledge and philosophy that Donald shares with his students today. A horse acts like a horse, they are all equal but they are also different from each other. The horse is an individual with its own needs, desires, character etc. like you and me. Each horse has unique problems and each horse has problems common to most horses. Be keenly observant as to where and when the horse is bothered and work on that specific point. Once the problem is taken care of and it ceases to be a problem, the horse can blossom. Traditional approach is more like avoiding and ‚going around‘ problem areas. Everybody has already heard this, „You can‘t do that with my horse“ or „ My horse doesn‘t like that.“ Find the problem and fix it. Go and help your horse through it, only then the horse can develop to its full potential. Fix them on the ground, this way you won‘t have to deal with them while riding. If you‘ve got the will, love and patience you can do almost anything with your horse. Just listen to him, he will let you know when you´re on the right way. But he will also let you know when you are on the wrong one. If this is the case, just back off and start it over again until he agrees with your approach. The horse is like a mirror! If the image you see doesn´t please you, don´t blame the mirror or go and buy a different one. Just go and change yourself! Then you will find out that being with horses can be progressive, fun and save for you as well as for the horse being with you. For more information feel free to contact Donald by e-mail .